During certain times of the year, it seems I enter into a period of gift giving. Mother’s Day, Father’s Day, end of the school year gifts for teacher, weddings, birthdays… the list goes on and on. Because it’s not always easy or budget friendly to go shopping for multiple gifts, I love the option of giving spiritual bouquets. These are prayers or devotional acts, such as the Chaplet of Divine Mercy, that you or a group of friends can offer for someone else to express joy, support, or best wishes on a special occasion. Since my parents prefer our prayers to any material items, we’ve started a tradition of creatively presenting them with these spiritual bouquets as gifts. My seven siblings and I each pick a day of the month to offer a special prayer or devotion such as a Mass, rosary, chaplet, or an hour of Eucharistic Adoration for my parents’ intentions. Then we write our spiritual commitment on a personalized photo card and display it in a frame. We’ve also done individual cards and tucked them into cardholders in a vase along with a dozen roses. One year, my sister was especially crafty with a box designed for an advent calendar. She labeled each drawer with the day of the month and put a little note inside from the giver about what they would do for my dad. Every day, he would open the drawer to find which of us was praying for him and the specific devotion we were offering for his intention. He deeply cherished it and made sure to text us each day to express his gratitude for the prayers. A spiritual bouquet doesn’t have to be this elaborate, though. A simple card is a great way to offer a collection of prayers for someone from a classroom, school, family, or group of friends. 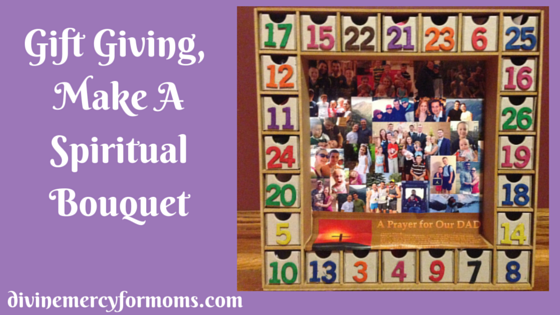 Spiritual bouquets are a concrete way to show support from the community to a person in need of prayers. Next time you find yourself struggling to come up with gift ideas, consider a spiritual bouquet. The benefits are eternal!